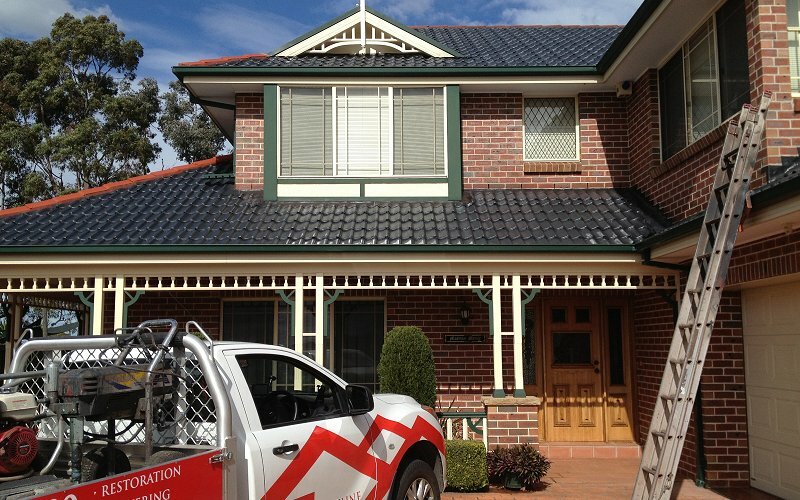 Roofline has been servicing Glenwood and the surrounding suburbs of Sydney for more than 20 years. Roofline has earned a reputation built around our core values of honesty, integrity and reliability. This means that Roofline does not employ commission driven salesmen, only knowledgeable and experienced tradesmen. Our team of highly experienced, qualified roofers are punctual and friendly, providing you with exceptional quality roof restoration services using the very latest in equipment and technologies to ensure you see effective and long-term results. We absolutely love the responses we receive from our customers when they see how our professional roof specialist are able to transform the appearance of their home. If you are looking to replace or restore your roof, Roofline can provide you with various options depending on your budget and the end result you would like to achieve. We can provide an obligation free quote and assist you in selecting the right colour, tiles and design to keep your home looking pristine. Roofline is a leading industry roofing specialist providing the highest quality in roof restoration services to customers in Glenwood. We take great pride in our products and workmanship, providing you with quality work that will increase the value of your property and extend the life and protection of your roof. Roofs take a heavy toll due to the weather extremities and can cause the roofs to fade and wear out. Your home is 30% roof, so it is a worthwhile investment keeping it in good condition. A professional roof restoration service from Roofline can help bring your roof back to life while saving you the cost of replacement. Roof painting is certainly a great way to rejuvenate your roof, giving it a modern look without all the additional costs of a complete restoration. In terms of painting, we can assist with virtually any roofing types, including concrete tiles and metal surfaces such as Colorbond®. I have terracotta tiles can they be painted? Painting terracotta tiled roofs requires specialized techniques and Roofline is proud to be one of the few Australian companies that specialise in painting terracotta tiled roofs. Our teams have many years of practical roofing experience, so you are assured of expert advice and effective visually appealing results for a surprisingly low cost. Why is High-pressure cleaning beneficial? When moss, algae and lichen are left to build up it accumulates in various rain channels it can lead to blocked or poor gutter drainage and overflowing water that runs down the walls of the house. This potential consequence of this is moisture problems and peeling paint. High-pressure cleaning will effectively remove any build up in the gutters preventing rot and extending the life of your gutters and roof. Our teams have extensive industry experience providing Glenwood customers with quality gutter installation services. Our gutter installations are meticulously assembled and installed by qualified roof plumbers. We don’t have standard gutters and need them designed- Can roofline do this? Quality guarantees- We offer a 10-year written guarantee on materials and to further provide you with quality assurances we offer a 7-year guarantee on our workmanship; all at no extra cost. If you need more information or would like to schedule an appointment, get in touch today, one of our friendly team members will be ready to take your call.